Laundry is one of those chores all moms have to do. No matter how many loads you get done, there will always be more clothes to clean. I love it when I come a cross products that smell so good, they make doing laundry more pleasant. As a Purex Insider, I often get to try new products that help provide fresh laundry and eliminate laundry odors. Which is something that I need in a house full of boys! And this time, I'm trying the new liquid fragrance booster in place of the regular Crystals I normally use. 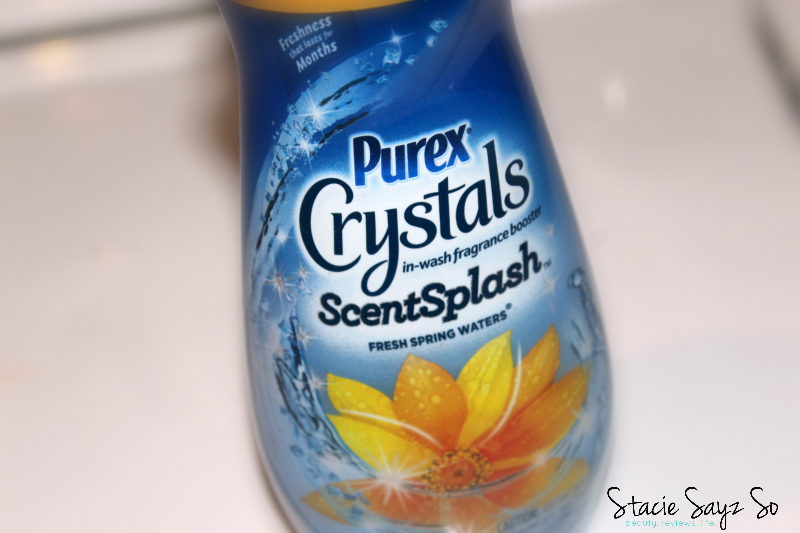 On behalf of Purex, I would love to give one Stacie Sayz So reader 2 bottles of Purex Crystals ScentSplash. Leave a comment to enter. For extra entries, use Rafflecopter. Giveaway ends 4/24/15. US only. Purex provided me with a sample but opinions are always my own. I do not currently use any but have only heard good things about it. This would be great to try and continue to use. I do use Gain, but it works so- so. It would be great to win this to compare. Yes i do, I love the way in leaves your clothes smelling fresh. I do not currently use a laundry booster, but I love the idea, can't wait to try! Yes, I usually use Purex Crystals for baby. Love them! No, I do not use any scent boosters, however I would love to try the Fresh Spring water scent! I do use scent boosters. I have not used a laundry booster. Sometimes. With my clothes, I was using Purex Crystals "solid", but I'm really wanting to get away from them, as I'm noticing some residue in my washing machine and on my clothes. Sometimes I use boosters but generally not. I have used one before and I actually really liked it. It made my clothing smell so good! I haven't used a laundry booster, but I sure want to! I never used in wash scent booster but after reading your review, I guess my laundry needs it. I love fresh smelling laundry. I do not usually use one. I do not use a laundry booster. I haven't tried one yet, would love to try the purex crystals! I have never used a scent booster but I do love the way fresh laundry smells. I do wish it would keep that clean scent a bit longer though. I would love to try this and see of the accent lasts longer. I do use a laundry booster at times when I am washing something that absolutely disgusting smelling. 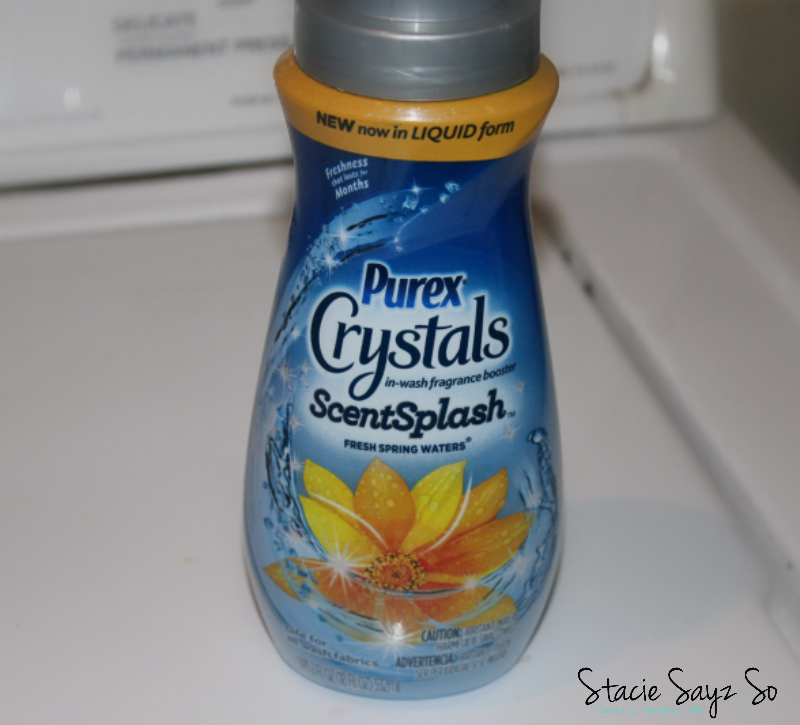 I use regular Purex Crystals and really like them. No, I haven't used those before. No, I do not currently. I do but mostly on blankets, sheets, towels, or things that will be packed away for awhile. I'm out of them right now. I have not tried a booster before, but I could definitely use it for my gym clothes! No, I've never tried a booster. Yes, I have used an in laundry booster in my laundry before. I do and I love it!! I use a different brand of in wash booster right now and like the extra scent. No I haven't. With 3 grandsons I would love to try it! No I don't use any laundry boost most of the time. I do not use one. Yes, I love in wash boosters. I currently do not use one. I do not use a laundry booster, but I would like to try one. I do not use it yet but would love to. I love Purex. yes i do! i usually use downy unstopables, but i love purex too! Occasionally I use it but everytime I run out I forget to buy more. No, I have never used an in-wash booster! I have never used booster before but have thought about it.